I wrote this article to clarify some popular questions about pricing and licensing in real estate photography. This concept may apply to other genres of photography as well. For most people not involved in any form of digital products (photography, design, software, etc), copyright and licensing are hard to comprehend. It feels like a foreign concept and for a reason. Typically, the scenario is getting some money for doing work as opposed to licensing. In the world of creative and digital products, licensing is a fundamental concept that applies to all creative work. The idea behind this is to allow multiple parties to use the product over some time. The more people want to use it (license) the more valuable it becomes. It forces the creatives to do their best to get paid. When you pay a subscription to use some software – it’s licensing, when you buy music – it’s licensing, etc. Photography is very similar. Pro photographers are creatives (artists) that have a mission of capturing the photos people will want to pay money for. In real estate photography, these photos serve the goals of selling, renting out or just building a portfolio. In other words, licensing is a permission to use the photos over a set period for defined usage. For instance, the default lifetime of the real estate photos is until the house gets sold. Typically, the license is granted for one year or until the listing is active. One of the main points of the licensing is that it is not transferable. If an agent bought a license, on this particular agent can use the photos. They cannot give it away to a designer or a builder. They sometimes can, however, give it to the owner for personal use (check the agreement). Usage and lifetime are the main components of a license. The real estate agents make up the majority of the clients in this industry. Therefore, the prices indicated on any given photographer’s site typically indicate 1-year non-transferable license. A typical real estate photography license allows web and social media publishing, printing advertising materials, printing posters, etc. – whatever it takes to sell or rent out a property. If, however, a client wants something in addition, like publishing a photo in a magazine or using it for the same home after some time in a different listing or have a perpetual license (portfolio), then it adds to the price, sometimes X times. It is typically not possible to give an exhaustive list or table of the pricing model, every situation is unique, and moreover, every photographer could charge differently. Some of the parameters are turnaround time, market real estate pricing, competition pricing, the area of use, usage rights, etc. I’ve gathered some of the most popular questions and answered them for your convenience. There are multiple scenarios covered within the Australian laws (Copyright Act). In this case, we are interested in just one case. The photographer owns the commissioned photos (commercial, i.e. created not for private or domestic use and not under direct employment) copyrights unless the contract says otherwise. In Australia, copyright protection is instant and free, and there is no need to register photos or do anything at all. The photographer owns the copyright to the photograph right away, and it lasts for 70 years after their death. There can be scenarios when the client wants a buy out some of the photos. This buyout is typically much more expensive. Also, getting a license doesn’t grant ownership, it only allows some usage rights. I paid you for the photos, doesn’t it make them mine? No, it doesn’t. You pay the photographer to create some work, and you want to use the photos. The photos have copyright protection instantly, and the images are considered the intellectual property of the photographer. You can sign an agreement to buy out the rights altogether, but it adds significant costs (see above). 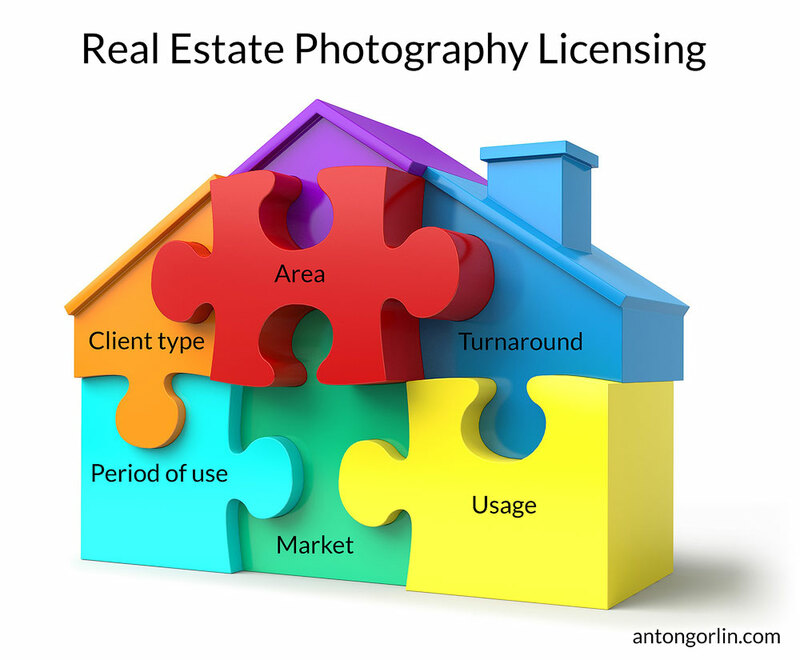 There are multiple licenses, and their type affects the real estate photography pricing. The standard agent license allows use for any sort of marketing to sell or rent out and is valid for the period of advertising (or until one year expires). You may think you want more rights than granted but really, why pay more? Please specify all usage rights you need to include in the quote. The house has been sold, and the new owner wants to sell it again. The agent puts up the same photos or gives them to another agent. Not allowed. The agent gives the photos to the designer/builder/stager because, well, they have the rights. Not allowed. Unless the photographer allows, all other creatives should license the photos too. The owner gets the photos for private use (allowed) and then puts them up on Airbnb or another rental site (not allowed). The builder or a designer license the photos for the portfolio with the perpetual license and then sells them to the magazine. How much is it to license a photo? The licensing cost depends on how you want to use the photos, the period of use, and the territory of use. I need only five photos, can you make me a deal? While it may seem that only a few photos should cost you just a fraction of a price, it isn’t true. There is a reason why photographers have a minimum package. There is absolutely no sense for me to drive 40 minutes to your place to do several photos and get $50. First of all, I pay for the fuel. Second, the photoshoot isn’t just my time at the location. It’s also travelling time, pack/unpack time and editing time. So, for instance, I charge $200 for a 1-hour photo shoot. Please add another hour for the travel and another hour for editing making it 3 hours in total. So, the actual hourly rate is 200/3 = $67. Now let’s assume we reduce the number of photos by half. We halve shooting time and editing time, making it 2 hours in total. Therefore, with the hourly rate of $67, it costs $134 instead of $100 as you could have assumed. Let’s reduce the number of photos by 75%. We now have 1 hour travelling time, 15 min shooting and 15 min editing making it 1.5 hours in total. The price would be 67 * 1.5 = $100. In the real world, there is also a constant administrative handling time, waiting for the client time, pack/unpack time, etc. There is no way to get lower than a certain amount. And there is one more gotcha. I could have used this time better. I could get a bigger assignment and use the same time to get more money. So, in most cases, it just doesn’t make sense to go below a certain threshold. The standard agent license I provide allows you to market the listing across different media types (social, web, printing materials, posters, etc.) for up to one year while the listing is active. This license is non-exclusive and non-transferable. This means you cannot resell or give it away to anyone including other agents, builders, designers, etc. The creatives (builders, architects, stagers, designers) get a slightly different type of license. It is still non-exclusive and non-transferable. The difference is the period of use. Obviously, these clients do not market their properties. Instead, they market themselves, using these photos to showcase their skills and expertise. Therefore, it doesn’t make any sense to license these photos for a year. These licenses are perpetual, and therefore, they typically cost more. Why is Airbnb Photography more expensive? At a glance, it may appear that rental properties should cost less to photograph. After all, the client isn’t getting hundreds of thousands right away. But in fact, it’s opposite. The photos for the rentals cost more because of the prolonged lifetime of the pictures. They keep getting you money month after month, year after year, across multiple online listings. So, it doesn’t make any sense to license these photos for a limited period. Why does Commercial Real Estate Photography license cost more? Again, at a glance, it feels like a commercial license should have the same price as some other regular licenses. But it’s not the case this time. If we do all of it on the same day, the travel time between the buildings is not free; I’ll include it in the cost. If we photograph across several days, I have a minimum call-out cost that Ito each shoot. Commercial photographs should be top-notch high-end photographs. This involves extra editing, unlike regular MLS listing photos. These photos represent the company, and the quality should be stellar. Also, an environment is more challenging (moving cars, people, powerlines, etc.) – these things add to the editing time too. And again, the period of use is perpetual, and the territory os use could be international. Also, for commercial projects with a lot of moving parts (like multiple travels around the city) sometimes it makes more sense to charge an hourly rate. But why should I license the photos at all? You license things in everyday life. Licensing is like a rental. When you buy music, it’s licensing, you don’t own it, and you can’t resell it. The same thing applies to the software and games that you got – you can’t modify or resell them. It can refer to any form of intellectual property. Regarding the photos, the fact that the photographer owns the copyright leads to the need of some means of transferring those rights partially to the client. That’s what licensing is for. Photography licensing is one of the basic concepts of the photography business, and once you get into, it makes a perfect sense. Regarding the real world, it is similar to the rental and grants certain rights of use over some time. Photography isn’t just a button-clicking, it is subject to the intellectual property rights. The photographer would be the copyright owner of the commercial photos even if the client paid for them. This is really a nice blog. Thank’s for share with us.